I came across one of the most interesting pictures ever taken. In 1995 researches at NASA pointed the Hubble Space Telescope at a dark and seemingly uninteresting spot in the sky near to Ursa Major (Great Bear). At least, dark to the naked eye. The size of the spot is roughly comparable to the size of an euro coin at a distance of 25 meters. So, what do you expect… blackness? Well, they saw this. This is truly awesome. 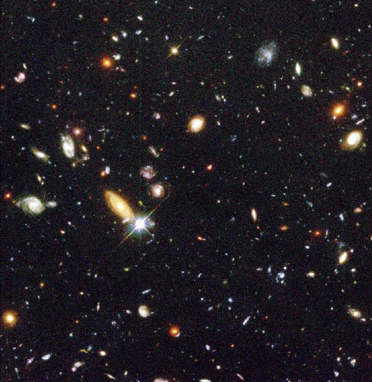 Each dot is a galaxy consisting of billions of stars. This is so immensely huge that it makes the mind stop thinking.